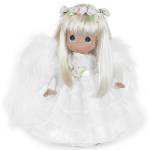 2014 Precious Moments Inc. 12 inch The Sounds of Christmas Angel vinyl doll, No. 4790 girl has rooted pale blonde hair with front curls, bangs, and a bun encircled by a red poinsettia wreath; painted green teardrop-shaped eyes and a smiling face. She is wearing a full long white with faint gold brocade gown with fur and lace trim, gold ribbon, red poinsettias at her waist; and white fur-like wings. The promotional photo shows a French horn, but the dolls sent to me come with a detailed golden trumpet instead of a French horn. This angel is a Linda Rick of The Doll Maker design. New, Mint, with a gift box.